For process plants to run at maximum efficiency, there has to be seamless information transfer during the design, construction and operation phases. Tobias Scheele highlights one important optimisation solution. In today's environment, process industry businesses must run operations more efficiently than ever before. To accomplish this, all aspects of an operation must work in perfect unison. Advanced Applications from Invensys Process Systems (IPS) helps to overcome barriers that inhibit the seamless information transfer between the business partners during the designing, constructing and operation of a process plant. Optimising field or plant lifecycles and improving performance and measurable results, today, tomorrow, and beyond is key to improving return on capital employed (ROCE). Within the lifecycle of a plant, advanced applications are involved before a project is ever initiated. This allows clients to innovate, build, and sustain their entire facility or clusters of facilities better, faster, and cheaper, over the entire plant lifecycle. Practicing lifecycle management means that, while individual modeling tools change over time, the lifecycle never goes out of date and is continually evolving. Models are a mathematical representation of the reality and allow engineers to make decisions based on assumptions that are verified by the model. As process industries seek new ways to improve and optimise their plants, they are demanding more support to keep their plants up to date and efficient. Within the lifecycle stages, various types of software are used to keep a plant running. Unfortunately this means users are developing models with software that is incompatible with each other. IPS' SimSci-Esscor SIM4ME simulation software strategy is a solution to bring all these various types of software together under a common modeling environment. This enables modeling of the plant lifecycle without requiring new models to be built for the different stages of the plant lifecycle. This simplifies modeling and simulation throughout the plant's lifecycle and improves productivity and simulation accuracy. - Conceptual design. What are the general process design options, such as process license selection, feedstock selection, decision on critical equipment and OPEX/CAPEX estimate +/-50 per cent). - Basic engineering. Decision on main unit operation design, design optimisation, closed mass and energy balances, safety concept, decision on main equipment and OPEX/CAPEX estimate +/-20 per cent. - Detailed engineering. Decision of all unit operation design, analysis of operability (such as start-up), process automation, safety system detail design, decision on all equipment and systems and OPEX/CAPEX estimate +/-5 per cent. - Procurement construction. System installation and FAT/SATs. - Start-up commissioning. Training, testing and OPEX/CAPEX estimate +/-0 per cent. - Operations maintenance. Optimise operations through APC and online optimisation. - Debottleneck revamp. Identify bottlenecks and plan for expansion. Plant owners and operators face the same fundamental challenges - to design, operate, and optimise a safe and profitable plant (Fig.2). 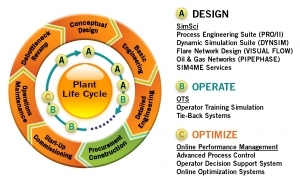 To succeed, process plants must command and control capabilities across the entire plant lifecycle. Most industry competitors offer a solution that only consists of three or more environments tied together. IPS has recognised the need for a consistent, integrated platform that allows the effective command of all necessary applications without requiring engineers and managers to master multiple environments. To this end, the company delivers advanced applications and applied modeling solutions throughout the plant lifecycle that give clients the competitive advantage needed to be successful. Built on the industry's most powerful simulation and driven by a single concept - one is better than three, IPS' SIM4ME is a set of consistent modelling environments which fluidly integrates the company's design - operate - optimise philosophy with proven methodology and functionality. SIM4ME preserves and leverages plant model equity and facilitates improved inter-program communications. Beginning with the conceptual design, the engineer creates the closed mass and energy balance using advanced process modeling technologies (such as SimSci-Esscor's PRO/II steady state simulator). In a process flow sheet environment the engineer chooses the relevant unit operations, underlying thermodynamics and components from predefined comprehensive libraries. The closed mass energy balance is fundamental for decisions on building material and equipment size, which is the basis for precise cost estimations. This iterative process requires the engineer to evaluate an increase in the amount of alternatives in an efficient and reliable way. This decision is viably important to the safety and economics of the plant. Decisions in the initial steps of the engineering cycle have a fundamental impact on the total cost of ownership of a process plant. Changes in the design (such as tighter heat integration) can increase the capital expenditure and in the long-term reduce the operational expenditure on utilities. Unfortunately, the best integrated processes usually have a tendency to be the most difficult to control. The intellectual property is captured in the steady state model and can be seamlessly reused using the SimSci-Esscor dynamic simulator Dynsim. For consistency, it is crucial that all simulators use the same physical properties (such as the SIM4ME Thermodynamic package). Dynamic simulation enables engineers to evaluate a broader aspect of the process as the steady state simulation allows. For example, the analysis of a maximum load on a flare header during an emergency situation, with a cooling water failure on a tower top cooler, over time. This allows for a more significant and precise design of the flare system. Simulation models can be beneficial in locating and testing processes that operators are unable to complete. In an operational environment, process simulation models are used to help determine the optimal maintenance action within the plant. The online optimisation is critically important to a plant's performance. Successful process modelling and online implementation allows real-time data from the process to be used by the optimisation system. Operating a plant in a safe and reliable status is extremely important; however, in today's business environment plant operation must be optimised for sustainability. With safety constraints in constant check and without violating quality boundaries while still receiving the maximum throughput and economic benefit can easily overwhelm the best operators. Manipulating thousands of variables in a short amount of time, keeping all constraints in check, all the while making sound economic decisions is best left to real- time simulators. SimSci-Esscor's ROMeo technology has a proven track record of generating significant benefit for the operation of large continuous process plants. As mentioned previously on this phase of the plant lifecycle, it is a competitive advantage using the same IP for the original engineering phase. For operating plants cost efficiently, the owner operator must continually monitor performance during and throughout the plant lifecycle stages. 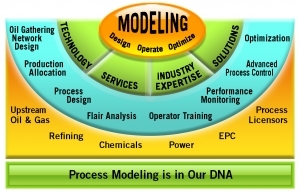 Diagnosing the root cause of process degradation or anticipating the need for performing maintenance, while monitoring the performance of equipment can be completed with a performance modelling tool.